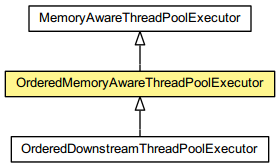 A MemoryAwareThreadPoolExecutor which makes sure the events from the same Channel are executed sequentially. NOTE: This thread pool inherits most characteristics of its super type, so please make sure to refer to MemoryAwareThreadPoolExecutor to understand how it works basically. As you see, the events from different channels are independent from each other. That is, an event of Channel B will not be blocked by an event of Channel A and vice versa, unless the thread pool is exhausted. However, it is not guaranteed that the invocation will be made by the same thread for the same channel. The events from the same channel can be executed by different threads. For example, the Event A2 is executed by the thread Y while the event A1 was executed by the thread X. // uses identity comparison only (see IdentityHashMap). // we need to employ more generic implementation. // Use the IP of the remote peer as a key. // Make public so that you can call from anywhere. If the expected maximum number of keys is small and deterministic, you could use a weak key map such as ConcurrentWeakHashMap or synchronized WeakHashMap instead of managing the life cycle of the keys by yourself. Executes the specified task concurrently while maintaining the event order. Returns true if and only if the specified task should be counted to limit the global and per-channel memory consumption. maxChannelMemorySize - the maximum total size of the queued events per channel. Specify 0 to disable. maxTotalMemorySize - the maximum total size of the queued events for this pool Specify 0 to disable. Returns true if and only if the specified task should be counted to limit the global and per-channel memory consumption. To override this method, you must call super.shouldCount() to make sure important tasks are not counted.